Awww… Aren’t Gussie and Jake the luckiest duckies around! The first shot is so clear you can see the ridges? on the beak….so cool! Thanks for the saturday morning pick me up & give them scratchies from me! Yes, they are our ducks. We have a total of six… four boys and two girls. 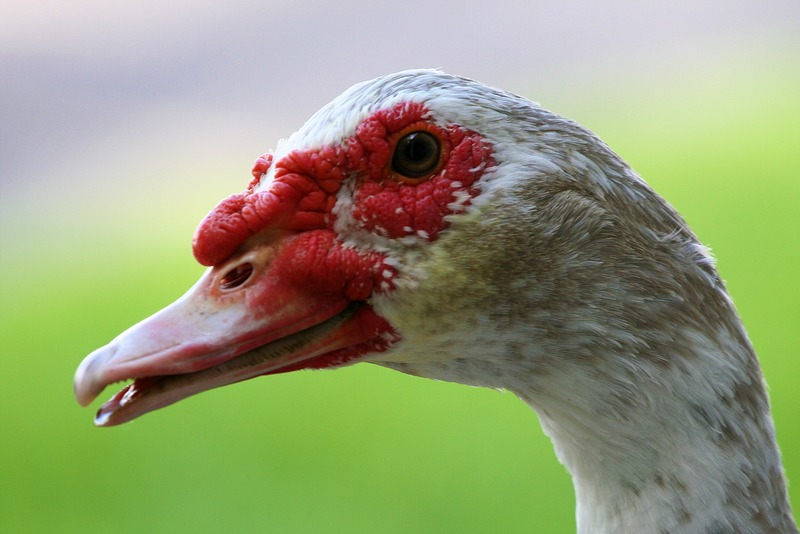 I can see how your pond is missing the presence of your Muscovy. They have incredible personalities, don’t they? Yes! Sweet. But do yours chase other ducks away… Our neighborhood duck did that. 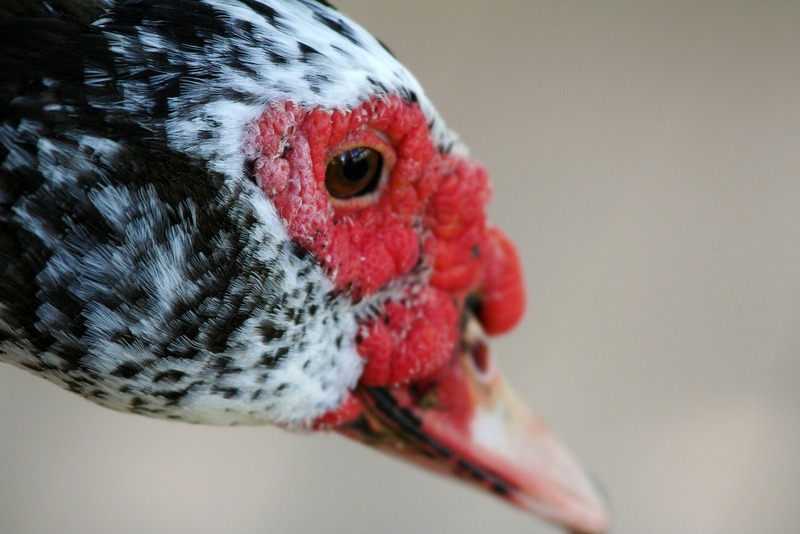 Or do you only have Muscovy? What handsome duckies they have become since I saw them when they were tiny! Can hardly wait to see them and everyone else sometime soon! Who knew that ducks liked a good cuddle! 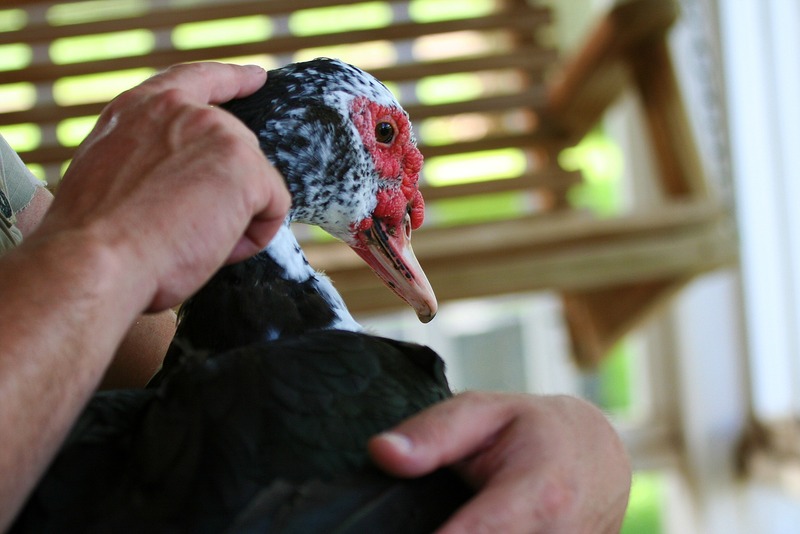 How do you get your duckies so sweet and gentle? I have five, all boys, and they much prefer to run and hide in their shelter rather then get attention. All of them are older, two around 6, and three about 4. Gussie, Jake and all the others are truly fascinating and lucky duckys. Of course all the animals at MBF are blessed and special. We had Muscovis for a long time, they had many clutches of chicks too! We sold some at the aution. Alas when my oldest daughter left home and went in the military we sold the rest too. The hens are so sweet!!! the drakes, gotta watch them, ours got really protective and slashed my thumb one day. But love the hens and they lay a lot of eggs!!!!! I’ve seen people with chickens on their laps (in blog photos), but these are the first ducks. I guess I have never seen their red stuff up close and personal. What interesting waddles they have. Is that the term or did I just make that up? Or maybe that’s what turkeys have…hmmm. I would have never guessed that ducks could be lapducks. Smile. 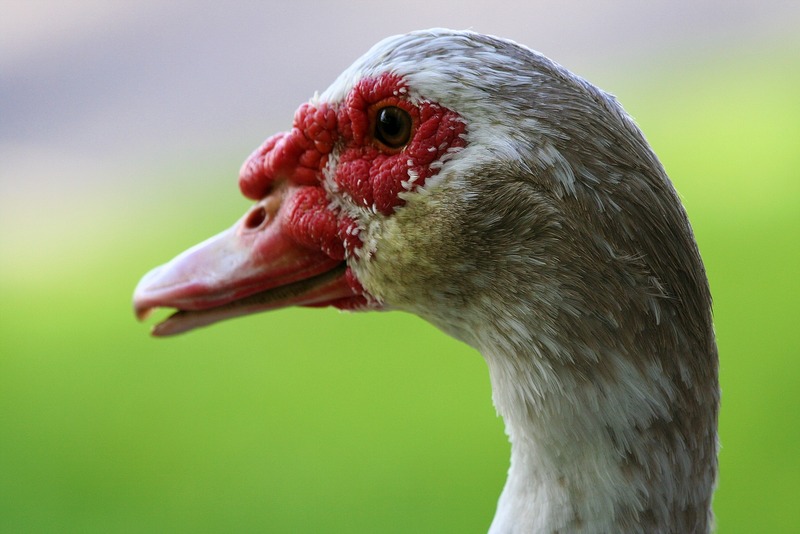 You did so wonderful portraits of your ducks. I remember them looking one like the other and now they look so different. They are very handsome! And so big! Looks they love to be cuddle. Have a nice weeke ahead. Ops! I mean “week ahead”. Duck whisperers! What fabulous photos. I imagine the brays are often joined with some serious quacking.